New possible variable star for VSX? Home > New possible variable star for VSX? Having been searching recently for unknown variable stars in DSS images, I stumbled upon this faint candidate in Vulpecula that had many POSS images available. 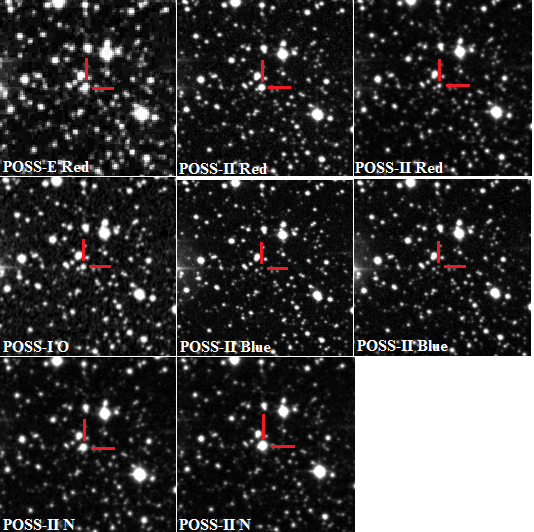 All POSS images (including POSSII-IR) showed the star to fluctuate noticeably in brightness over time (see attachement). The object did not appear in the VSX, or in any variable star catalog suggested by Vizier, and it wasn't listed by NSVS (taking into account the uncertainties and magnitudes). I wasn't able to access ASAS data however, so I can't be sure on that. I have read all VSX information concerning reporting variable stars, but knowing that I'm rather new to variable star observing, I thought it would probably be better getting an opinion before going on to reporting. I'm registered to VSX and have signed up for the VSX yahoo discussion group, but I'm not able to post anything there (at least for now), so I decided to post here first. The object is catalogued as 2MASS 20060630+2213287 (IR source), USNO-A2 1050-16403172 (+15.8 mag star acc. to wikisky), USNO-B1 1122-0534439, AllWISEJ200606.30+221328.7. The J2000.00 coordinates are: 20:06:06.302 +22:13:28.76. POSS-II Red (1991-09-08): Red mag: +13? / POSSII Blue(1988-06-14): Blue mag: +18.5? POSS-II Red (1992-09-19) Red mag: +15.66? / POSSII Blue(1990-07-26): Blue mag +18.5? POSS-II N (1994-06-15) Near-IR mag: +12.82? / POSS-II N (1995-07-19): Near-IR mag: +12? It is likely that I've got some of the magnitudes wrong. Alot of these are estimated based on comparisons in other images and to other neighbouring stars. Unfortunately, with only these POSS images it seems impossible to give the period of this variable. I also don't know what kind of variable it could be, but I assume it's something like a Mira type variable (based on its brightness in the near-mid IR especially) and the rather significant changes in luminosity it displays. But I can't actually be sure.